Special features: first look at new Captain America film ; deleted scene. Chris Hemsworth, Natalie Portman, Tom Hiddleston. Not Bad For A Sequel submitted by GJBarnett2 on July 1, 2014, 8:47am ... and great graphics. 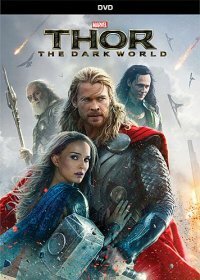 Thor: The Dark World submitted by mk31 on July 20, 2014, 3:37pm I was very disappointed by the first Thor movie, but this one was even worse. These are the only Marvel movies that I don't like. Would not suggest watching it. Worth a Watch submitted by dvolpe on August 24, 2014, 2:33pm Not as good as the first Thor in my opinion, but sequels usually aren't. Most of the characters are back in this one, and they all give good performances. The biggest drawback for me is that Malekith the leader of the dark elves is simply not as compelling a villain as Loki. Still, if you were a fan of the first movie, you'll probably enjoy this sequel too. Good sequel submitted by beeniepie on August 27, 2014, 7:23pm It wasn't as witty as the first, but it was a solid sequel. I enjoyed the attempts at scientific explanation, even though they were way off the mark. So bad submitted by Gina Hewitt on July 10, 2016, 3:00pm Tom Hiddleston is the only good thing/actor about this film and he isn't featured. Worse than the first submitted by toschag on August 4, 2016, 7:07pm The first was okay, this one felt shoehorned in to get Thor ready for The Avengers series. Good submitted by leenajong on July 14, 2017, 9:11pm Very entertaining, fun to watch. Pretty good submitted by KOH on August 28, 2017, 7:35pm Decent superhero movie. Chris Hemsworth was pretty great. Dark World submitted by SBNB on June 15, 2018, 3:29pm It's entertaining. Interesting to see what happens with Loki's character. Good addition to the Marvel Cinematic Universe. I can't wait to see what happens in Thor: Ragnarok. Interesting! submitted by Xris on June 26, 2018, 12:21am Interesting that Jane can contain the power that she does! Loved when they found the lost keys! And Eccleston does a great job with being a Dark Elf, what with the language and all! Another great Marvel movie! Decent submitted by Thomas B Brown on July 7, 2018, 10:11pm Definitely a bit darker. I like the ending and of course, Loki. Forgetful submitted by a2vallem3 on July 30, 2018, 4:27pm I was talking with a friend and we were ranking the Marvel movies and Thor The Dark World was last for me because I literally remembered nothing from it. I remember more from Ant-Man than this one and I forgot that I had even watched that.